by partnering with God to advance His. A life, all your own. Are you satisfied with what you’ve built...the impact you’ve made so far? And He invites you to help advance it on earth. It's a journey of reorienting your kingdom around God’s goals. You’ll find meaning in life like never before. 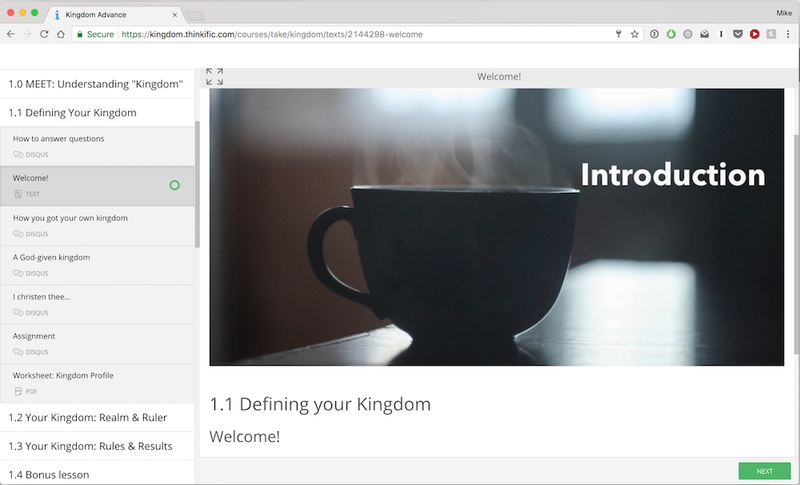 "This course has taught me just how big and extending God's kingdom truly is." Curious, open-minded Christians and non-Christians who seek more purpose in their daily lives. Any age, any walk of life...if you have an open heart, you're welcome! 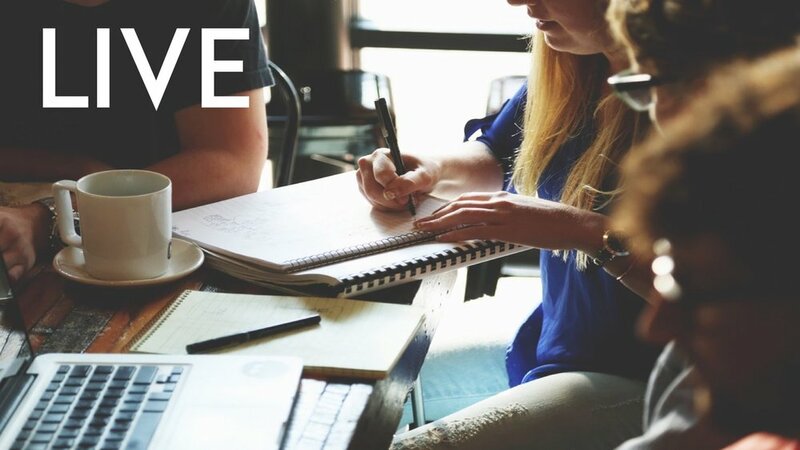 Together, you’ll experience the kingdom of God by meeting, learning, leading and serving to transform your own kingdom and community. The course is eight weeks. 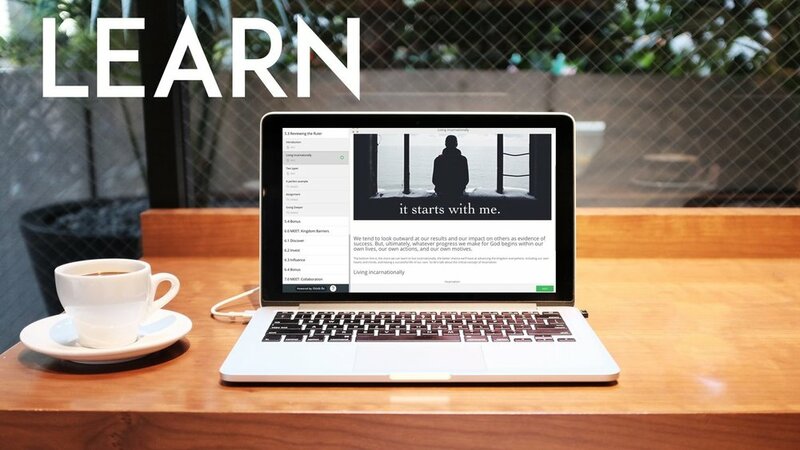 Each week you'll meet once and have three Lessons to complete online, at your pace and schedule. A Lesson from the course. Lessons include opportunities for group discussion. 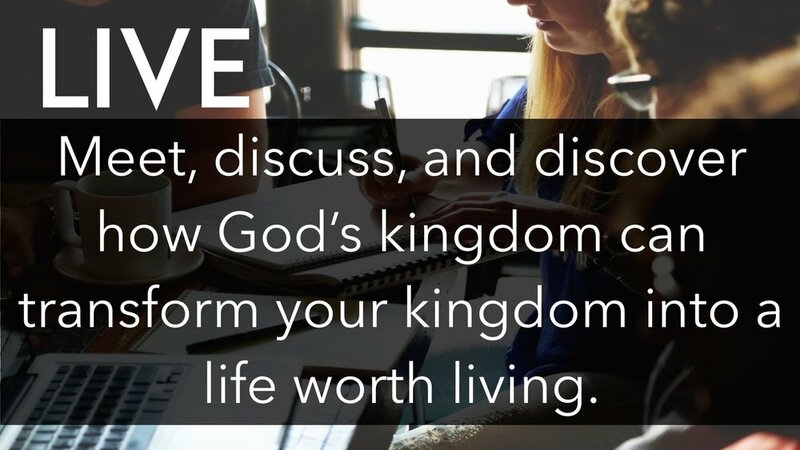 Each week, you'll learn and practice life-changing topics. 1. Who is the course for? Open-minded, open-hearted Christians and non-Christians seeking more meaningful lives. 2. What knowledge is required to join? No knowledge of the Bible is necessary. 3. Is this course a Bible study? The goal is life transformation...to reorient our lives around God’s kingdom and values, as found in the Bible. 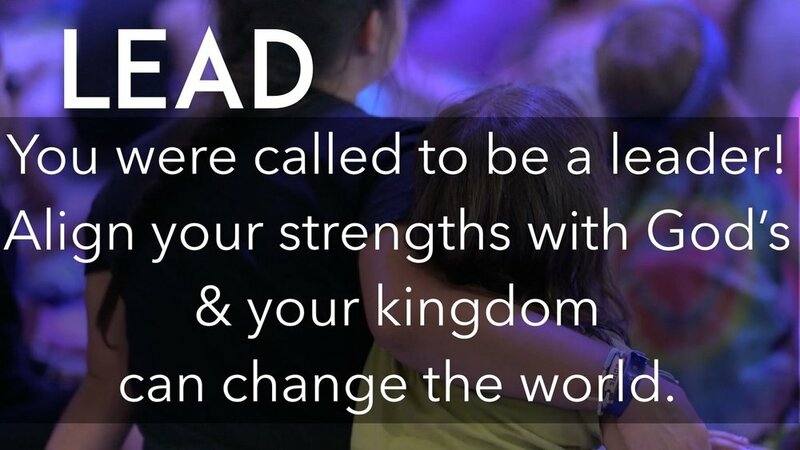 The emphasis is on internal change, supporting each other, and helping our community with Kingdom acts. 4. How long is the course? The course is eight weeks. Each week starts with a "Meet." During the week, there are three Lessons to complete online. You'll end the course with one final Meet together. 5. What does the Meet look like? Each group's will look different, but Meets are casual, and usually contain some combination of food, discussion, prayer, and fun. Did we mention food? 6. What do the Lessons look like? 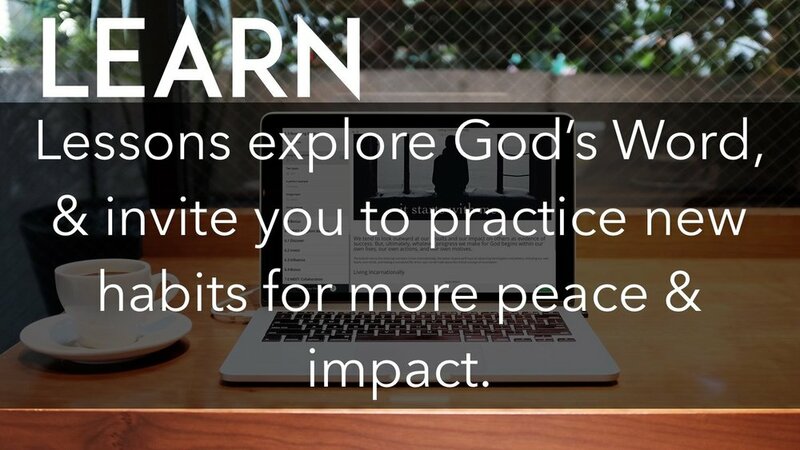 Lessons help you interact with scripture and answer thought-provoking questions. Lessons take about 15 minutes. 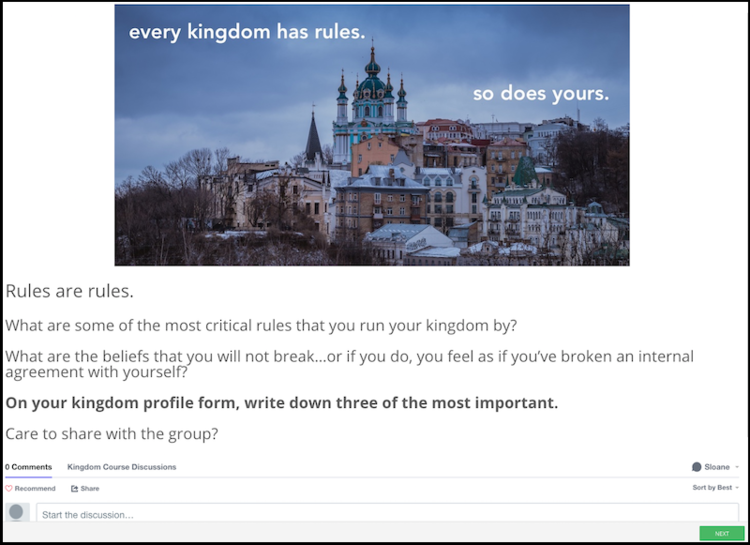 Every lesson includes online, private discussions, exclusive to the group. *Laptops & computers work best. You can also use smartphones & tablets. Left: image of the course. 7. Are the Lessons mandatory? You’ll get the most from your experience by doing the Lessons. The group creates a project that will benefit their local community in a practical way that also advances God’s Kingdom. 9. Is the Internet necessary? And do I have to be a geek? Internet access is necessary for discussions, and is highly encouraged. You’ll get the most being online. No need to be a geek! you can do this course! 10. What if I don’t have a computer? You can do the lessons with someone from the group who does. 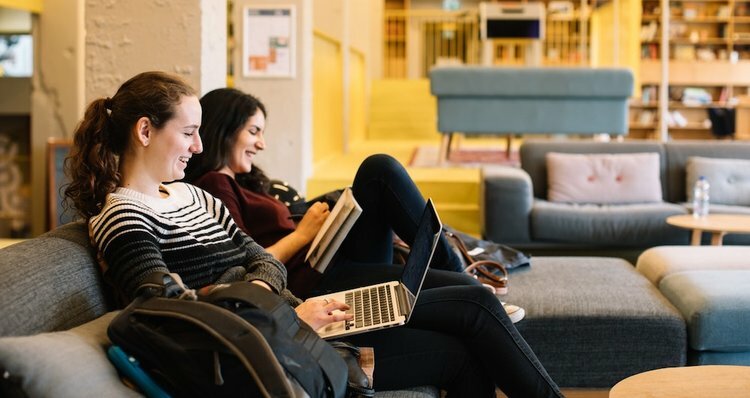 Most libraries have computers with Internet access. A printed workbook is also available. 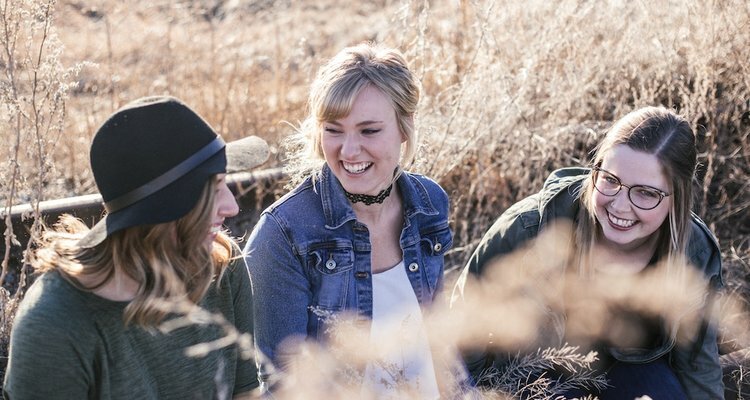 This course offers opportunities for real life change. Real change requires commitment, reflection and action. Please be prepared to make the course a priority. You can be a part. Left: image from the course. 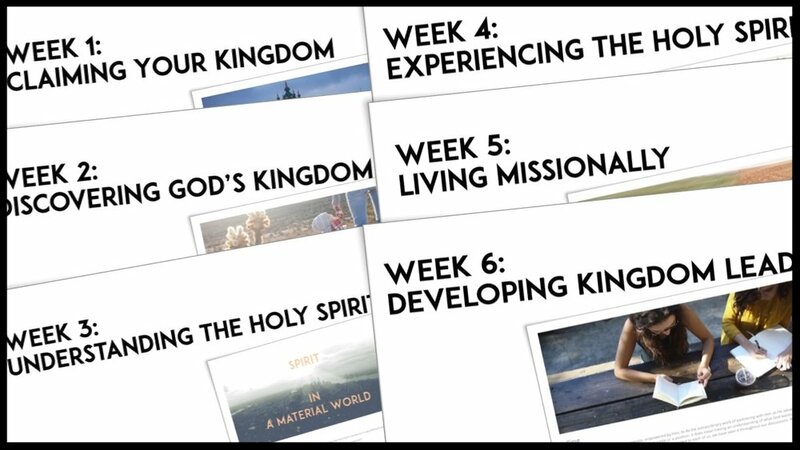 Find a Kingdom Course near you! Thank you! You’ll hear back shortly. Pastors & Church Leaders click here.